Amid the outrage (justified in my view) in the Ferguson case, I am consumed by another death: that of a 16-year-old neighbor. The young man, brilliant and sensitive, took his own life on a Sunday night a few weeks ago. I know his parents, lovely and loving people. Their son I mainly knew as a kid on the block. I watched his growing up through glimpses on the street, on the way to and from school (he went to a nearby school, not far from the one my children attended). At last glimpse, he’d grown tall and looked very much a young man on the verge of adulthood. Off and on over the years I’d hoped he and my daughter might meet; incredibly, they share a birthday. But somehow they never did meet. Now they never will. I had coffee with his mother just two days before that Sunday. I think back longingly to that sunny morning. We chatted about our kids, the way parents do, each expecting to have many such conversations in the coming years. Each thinking of the future in the brightest terms. When I saw his mother again she cried and hugged me and said the very thing that I was thinking: If only we could go back to that Friday morning. If only we could reset time. if only we could go back, and stop him. I dreamed of this boy the other night. He was accompanying me somewhere. I didn’t know him in life, but now I’m dreaming about him. My unconscious mind has a lot to go over. I knew another boy who killed himself at the same age. This boy I knew. And I still mourn him, six years later. Yesterday I paged through Joan Didion’s The Year of Magical Thinking to read once again her account of losing her husband when he suffered a sudden heart attack. It’s a powerful book; Didion helps me understand profound grief (horribly she would later suffer the loss of her only child to a baffling illness). The magical thinking of the title refers to her conviction that he would come back. She knew he was dead, and yet she was at the same time sure that he would find a way. She just wanted him back, so badly. These are dark times now for these parents on my block. I wish I knew a way to bring comfort. There may not be any, for a while. Staying in touch, being a community, that would be something. Didion had a friend who brought her congee from Chinatown; it was the only thing she could keep down. Congee. I wonder if should try to find some. For now, they are with family, in a different part of the country. Hopefully that’s a good thing. I’ll be with family, too, on Thanksgiving. This year, I feel a deep and pain-tinged gratitude for all that I have. At a ripe old age, I’m learning a foreign language, one that young women are naturally conversant in: the language of cosmetics. I have absolutely no natural talent for this. My idea of makeup is lipstick, a swipe of mascara and a few dabs of a foundation to hide the blotches around my nose. But who am I kidding? Most days I’m the best I can do is slather Olay cream on my madly dry skin. So this is my state of ignorance when I accompany my daughter, Vanessa, to Sephora. What is she shopping for? Under-eye primer. Under-eye primer. The words mean nothing to me. Turns out it’s a cream you put on before under-eye concealer. “You wear under-eye concealer?” I ask. She’s all of sixteen, but she appears to believe she has circles under her eyes. But back to the primer. It turns out that faces are like walls. The prime kinda does the same thing. When you’ve entered middle age without knowing what primer for the face is, the news is not exactly earth-shaking. Still, in the spirit of the moment, I bought primer “lash builder primer,” by Clinique. “Conditioning undercoat boosts benefits of Clinique mascara, extends wear.” I have to say it sounded kind of great. Mascara never seems to last on my lashes; that’s partly why I rarely bother with it. I can now smugly report that my mascara, combined with primer, lasts a full evening. Oh, baby! I actually had trouble getting the stuff off. Naturally, I’m not getting too carried away. I know a woman does not need makeup to look and feel good about herself. I Girls shouldn’t feel they need it; but many do. it’s part of meeting cultural expectations. I’m part of a generation that said, f*** that, but this generation is different. They seem to find makeup empowering. I dunno, some girls definitely overdo it, and end up looking like 30-year-olds, but I figure there are more important things to make a stink about—like equal opportunity and equal pay for equal work. We have a ways to go there. And while we’re getting there, I may need a good eyebrow pencil. It doesn’t look as tasty in my Pyrex dish as it would in an elegant trifle dish, but this Pumpkin Tiramisu from Food and Wine magazine’s Thanksgiving issue is a winner. It’s nearly as easy as pumpkin pie–easier, for those who don’t want to bake. I served to this to my book group, and nearly every woman wanted the recipe. 1. In a large bowl, whisk the pumpkin puree with the brown sugar, ginger, cinnamon, salt, nutmeg and 1/2 cup of the granulated sugar. Add the mascarpone and 1.5 cups of the heavy cream. Using an electric mixer, beat the pumpkin mixture at medium speed until soft peaks form; do no over-beat (getting to soft peaks too some time, more than I expected). 2. In a medium bowl, whisk the cooled coffee with 2 tablespoons of the granulated sugar until it dissolves. Dip both sides of six ladyfingers in the coffee and arrange them a single layer in a 4-quart trifle dish. Spread 1 cup of the pumpkin mousse on top. Repeat the layering 5 more times, ending with a layer of the pumpkin mousse. Cover and refrigerate the tiramisu overnight. 3. In a large bowl, using an electric mixer, beat the remaining 1 cup of cream with the remaining 2 tablespoons of sugar until soft peaks form. Dollop the whipped cream over the tiramisu, garnish with shaved chocolate and candied ginger and serve. 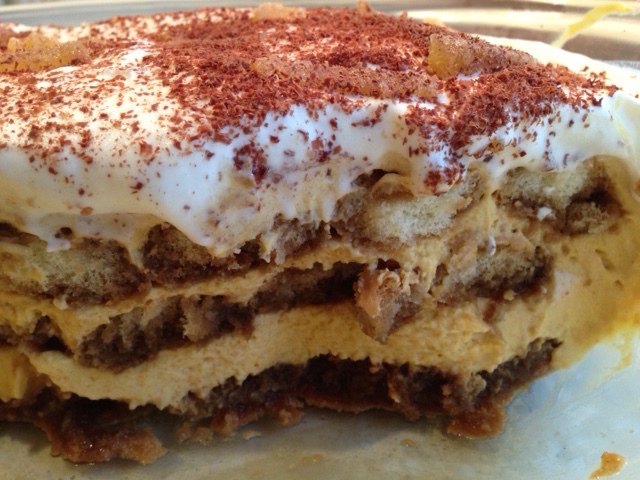 The tiramisu can be refrigerated for 2 days.